How do you entertain yourself when you’re sewing? I mean, when you aren’t really concentrating on a tricky step or focusing on getting the most perfect edgestitching ever, what do you do with your brain? Personally, I love to listen to podcasts, and I’ve assembled quite a few that I like. Actually, I subscribe to more podcasts than I have time to listen to. Here are some of my favorites. Do you have any to add to the list? 1. Freakonomics. My current favorite, not least because of the catchy theme music. But also because it’s so interesting and full of fascinating facts about economics and their extraordinarily large reach across our lives. I honestly thought economics was all numbers until I started listening to this show. 2. This American Life. I love all the wonderful stories and glimpses into people’s lives. Plus, who can resist guests like David Sedaris? 3. Radiolab. (Can you tell I’m a public radio junkie?) This show focuses on really interesting science-oriented bits that you’ll find yourself thinking and talking about for weeks afterward. 4. StoryCorps. If you want to feel connected to humanity, here’s how to do it. Some are funny, most are touching, all are beautifully edited and presented. 5. The New Yorker: Fiction. In which authors select and read aloud a piece of fiction that was previously published in the New Yorker and talk about why they chose it and what they love about it. 7. The Dinner Party Download. A fun pre-weekend podcast filled with lots of current events, factoids, interesting guests, and even a theme-related drink recipe each week. 9. CoffeeBreak French. Learn French on the go. 10. 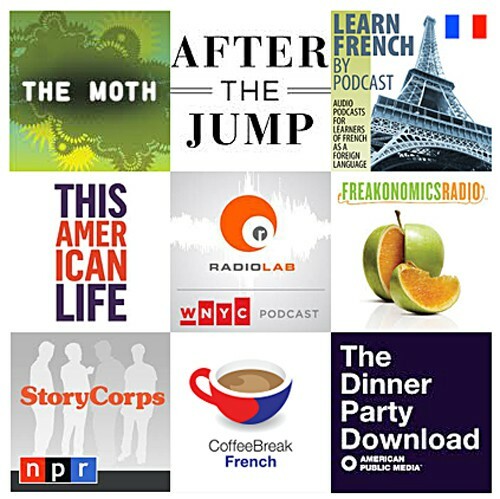 Learn French by Podcast. A new one for me, but so far I really like this topic-related method of learning French. 12. The Longest Shortest Time. The podcast is all about the trials and tribulations of parenting. You’ll laugh, you’ll cry, you’ll connect with other parents over all sorts of topics. What do you do when you’re sewing? Between Freakonomics and This American Life, I could fill my days! I used to work in an archaeology lab (only partly as glamorous as it sounds), and I worked my way through years of back issues of This American Life. My husband and I listen to Freakonomics when we travel–which is nice, because we have the best discussions afterward. Will have to check out RadioLab–I’m such a science junkie! I can think of nothing more relaxing/stimulating than sewing and listening to an audio book. If I don’t have one on hand from the library then I go to librivox.org. Me too! Listening to podcasts while sewing is the best! But I usually have to pause during tricky sewing or when I use the serger. To your awesome list, I would add the Slate Political Gabfest and Thread Cult. For the sewing obsessed, Thread Cult is really great. I either listen to music to keep up with the kids’ tastes or listen to an audiobook from audible.com. Thank you for these ideas! I usually listen to This American Life but it’s nice to have some new ideas as well. I used to listen to the NYTimes Book Review podcast but then my to-read list of books became a bit out of hand and I decided to take a break. I listen to sky.fm. There is very little commercial interruption and I can choose what type of music I want to listen to. I have found that if I listen to a genre of music I don’t normally listen to, it makes something like cutting out patterns a little more fun. Wow, your feed is very like mine! More than half of them are the same on my Downcast. I’ve seen David Sedaris more than once live, and can’t stop myself listening to his stories time after time on TAL. Wait, wait and Car Talk are in my feed as well. Have you been able to learn French by listening to those? I love This American Life. I like audiobooks or listening to my favorite TV shows I’ve seen a million times (Friends, Downton Abbey). Mary, I’ll check those out! And Sandi, I minored in French in college, so I had a base to start from. But I’m pretty rusty, and all the verb reviews have been especially helpful. Another one to check out “Creative Mojo” by Mark Lipinski. It’s about creativity and he talks to a wide variety of people, not just quilters. “Q” with Jian Ghomeshi focuses on the arts, culture and entertainment. I might be little bit in love with this man. Great voice and he is a fantastic interviewer. If you’re a fan of Joni Mitchell, that interview is a good place to start. “Under the Influence” with Terry O’Reilly is an exploration of advertising and marketing. His older show “Age of Persuasion” is also excellent. This show is very entertaining and leads to good discussions at our house. “Ce’st la vie” avec Bernard St-Laurent looks at life in French speaking Canada. He also has a very fun “word of the week”. “Vinyl Tap” with Randy Bachman covers music over the past 60 years or so. He picks a theme and explores the music in it. Because he’s been a musician for the past 30 years, who didn’t drink or use drugs, he can recall some great stories about all kinds of artists he’s worked with. Great for sewing to because you don’t have to pay attention too hard. I don’t think you can listen to this as a podcast, but you can catch it on Friday, Saturday and Sunday evenings. I stick my iPhone in the pocket of one of my Lisette Portfolio dresses and listen to podcasts all day including This Amercan Life, The Moth, and Radiolab. I second the Slate Political Gabfest and think you should give Snap Judgment a try. Liesl- your French podcasts caught my interest, and then I read on to find out we probably had numerous classes together in college! Having minored in French as well and graduating only a year behind you at our alma mater, it’s highly likely our paths crossed in the French dep’t. Little did either one of us know then that someday my kids would be wearing your designs:). Snap! Though I do pause when reading new instructions 🙂 Have you tried ‘Stuff you missed in History Class?’ (howstuffworks.com). Fascinating! Thanks for the list! I turn the TV on and watch old Project Runway shows or anything else fashion related. I’ve already seen them so I am OK with listening. It’s like I am in the workroom at Parsons! Thank you for the list of Podcasts. I will definitely listen to the French one!! A Canadian friend put me on to the Vinyl Cafe podcasts- just so brilliant. Thanks for this list (and the other suggestions in the comments). I also sew to podcasts and use about half this list plus some from the BBC. The other thing I have is the TED app for iphone and I watch (well mostly listen) to TED talks while I sew. I listen to the old Design Sponge podcasts, After The Jump, lots of Radio 4 podcasts like Desert Island Discs (facinating indepth interviews) The Archers (sort of like a soap opera set in a fictional farming village in England) Woman’s Hour (daily news, politics, culture with a focus on womens issues) and Thread Cult. Thanks to everyone for giving me some new podcasts to try!